Monty Montgomery was put to the test right off the bat when he became a rules official. The first ruling he made in the first tournament he ever worked is one he won’t soon forget. It came at the boys 4A state high school tourney more than a dozen years ago. A competitor hit his ball up against a cart path. With the nearest relief, he had a tree that would interfere with his swing. While Montgomery was sorting out the issue, the player’s father was throwing in his two cents regarding the situation. Suffice it to say the two disagreed on precisely how to proceed. “I said, ‘Sir, I guarantee we’ll get this and get this right,'” Montgomery recalls. The player, slightly under the tree after taking relief, ended up hitting his shot onto the green. “I kind of looked at the father and said, ‘I told you we’d get it right,'” Montgomery said. A little later, the tournament’s chief rules official Gene Miranda, with whom Montgomery was in contact via radio while making the ruling, came to the site and asked what parent he had heard in the background during the ruling. Montgomery said he didn’t know, but after a little investigating, the player with whom Monty was interacting was Kent Denver’s Gunner Wiebe. Miranda then informed Montgomery that he had been arguing with Mark Wiebe, a two-time winner on the PGA Tour. “That was funny,” Montgomery said in thinking back on the moment. Such is the life of a rules official. Over the years, there are going to be moments like those that stay etched in the memory. On Wednesday night, more than 12 years after working that first event, Montgomery (pictured) had another memorable moment. That was when he received the Jim Topliff On-Course Official of the Year Award from the CGA. The honor — named for Topliff, a longtime tournament director for the CGA who passed away in 2007 — is given out annually to a volunteer rules official who typically works quite a few days and makes an impression while conducting his or her duties. Montgomery, a 69-year-old lifelong Coloradan, put in 31 days of rules officiating in 2018, according to the CGA, making him one of nine people who worked at least that many days this year — out of the 127 officials on the CGA roster. In a similar vein, a Volunteer of the Year Award is typically also given out at what is now known as the CGA Women’s Golf Summit, which in 2019 will be held March 9 at Pinehurst Country Club. “It’s truly a deep honor to receive this (Topliff Award),” Montgomery said on Wednesday at Pinehurst, where the CGA held a holiday and retirement celebration for three of its staffers — Gerry Brown, Laura Robinson and Anne Bley. “I know what it stands for and what it goes to. I’m honored someone has recognized my efforts. When I go to a golf course, the days I volunteer, whatever assignment they give me that’s where I go. And they always know I’m going to do what they ask me to do. Making the honor even more meaningful for Montgomery is that he knew Topliff a bit. When Monty was a senior at Bear Creek High School, he said Topliff taught at nearby Bear Creek Elementary. And Montgomery said Topliff helped found the men’s club at Foothills Golf Course and was it first president. Foothills is Montgomery’s home course and he’s twice been president of the men’s club himself (2006 and ’16). 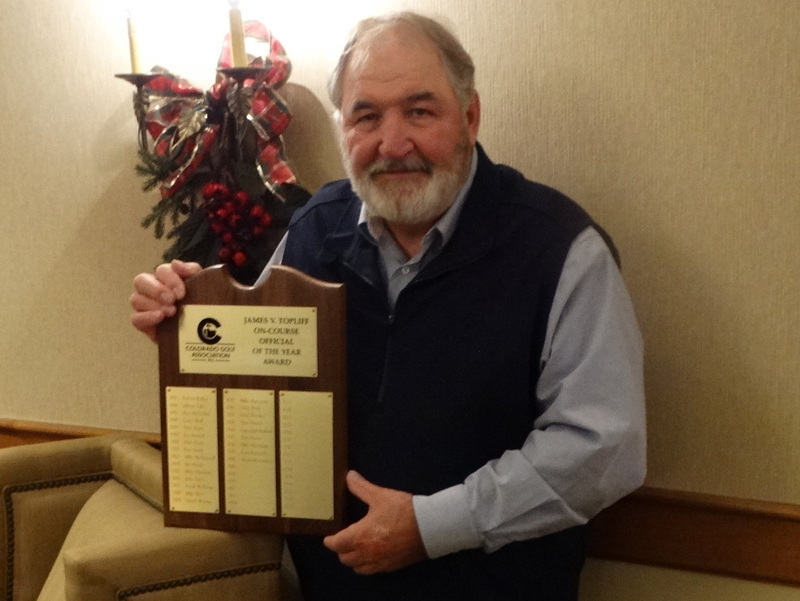 Greg With, a prominent rules official and a past winner of the Topliff Award, serves on the CGA board of directors and chairs the CGA Rules Committee, which decides on the Topliff Award recipients. “In Monty’s case, I don’t know of many rules officials that connect with players like he does,” With said on Wednesday. “He’s a big guy, but he’s just like a teddy bear on the course. He’s able to administer the rules in ways that players — particularly junior players — understand, and they get it. So we really appreciate that. “He’s done this for more than a decade, and he’s worked a lot of days every year. He’s well known at the tournaments he works. Approrpriately, With is among the rules officials Montgomery calls his mentors in recent years — along with Mike Rice, Mike Boster and CGA board member Brad Wiesley. But it was Dustin Jensen — a onetime director of youth programs for the CGA who went on to become the association’s managing director of operations before returning to North Dakota a year ago — who is responsible for getting Montgomery into officiating in the first place. You see, when Montgomery first joined the Foothills men’s club board 14 years ago, he volunteered to be on the rules committee, which entailed going to a rules seminar. And the next year, he attended the seminar for a second straight year. Nowadays, while Montgomery works the CGA’s most prestigious tournaments — the Amateur and the Match Play, in addition to senior majors — about two-thirds of his officiating days are devoted to junior golf events. “My best times in the CGA are working with the kids — the Junior Golf Alliance (of Colorado events),” he said. “When they look up at you and say, ‘What do you mean I’ve got to drop my ball on the concrete? It’s a brand-new Titleist.’ I say, ‘Well, son, sorry about that. This is the rule’ and explain it to them. I may take too much time than I should, but with the kids, every situation is an opportunity for education. The parents will come up and say, ‘Thank you.’ That right there, that’s what I work for — the thank yous. You’re helping write my paycheck. While many officials measure their ability as a rules officials largely by how they score on the PGA/USGA Rules of Golf exam, Montgomery fully admits that isn’t his forte. Montgomery, like all rules official, have a big change coming, with the new Rules of Golf modernization taking effect on Jan. 1. Suffice it to say Montgomery knows he’ll be devoting a lot of time to studying the rules between now and the spring. “I don’t have it down pat (yet),” he said. “I’m pretty apprehensive. I’m signed up for the 3 1/2-day rules school in March. I’ve been to a four-hour (CGA) rules seminar. Now I’m starting to read the book and study the book. Mike Rice is sending me links and saying go to the USGA site. They have all kinds of videos you can watch. Montgomery, who retired from the UC Health Sciences Center — where he sold medical and dental instruments to students — about 14 years ago, doesn’t by any means limit his time on the golf course to officiating. For many years in retirement, he’d play roughly 100 rounds of golf annually. And though heart problems have curtailed that somewhat, he’ll still get in almost 50 this year. And while he says he hasn’t played to it in 2018, he owns a 9.8 handicap. By the way, as you might expect, Monty is Montgomery’s nickname. But it’s slightly more complicated than that. He said everybody outside Morrison — his hometown since 1956 — calls him Monty. But in Morrison, he goes by Gary since his dad is the original Monty. For the CGA’s part, it can just call him the 2018 Jim Topliff Award winner.